Welcome to the musical world of Spinout family affairs, from the online radio show (The Spinout Show), to the live outing and club night (The Spinout Revue), on to the record label (Spinout Nuggets), then collecting it all under one hat as Spinout Productions, with side orders of Little Miss Mojo and Club Peel too! These pages will be updated with all Spinout affairs, and associated happenings, but it’s not just about us……it’s about you too, and we’d like to build up a community of similar lovers all under one roof. We appreciate your ears! 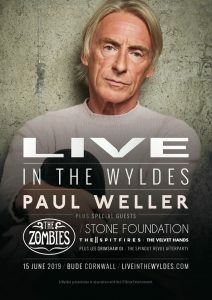 We are very pleased to be joining the line-up for Paul Weller – Live In The Wyldes, with Paul Weller, The Zombies, Stone Foundation, The Spitfires and local lads The Velvet Hands. And we’re throwing an afterparty with The Spinout Revue, so it makes sense for me to welcome Dave Grimshaw to join me! We’re real pleased to be part of this mighty fine weekend again, and Lee Grimshaw and Dave Grimshaw will be spinning some Spinout fave raves during the Sunday happenin’. Sen-Sa-Shun – Cornwall’s Mod-Infused Weekend, The Griffin, Newquay – Glyn Preece, Mark Taylor, Dave Weir, Ian Hurford, Sonya Fisher, Alan Saunders, Gini Sykes, Caroline Dann, Lee Hewett, Harry and Jay (Sound Preservation Society), Chris Harvey, Matt Todd, JunkWax – with residents Lee Grimshaw and Dave Grimshaw, and live vocals from Little Miss Mojo. And more! 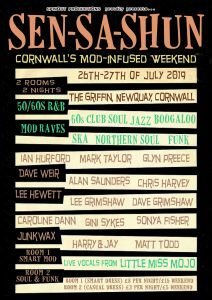 26/07/18 – Sen-Sa-Shun – Cornwall’s Mod-Infused Weekend, The Griffin, Newquay – Glyn Preece, Mark Taylor, Dave Weir, Ian Hurford, Sonya Fisher, Alan Saunders, Gini Sykes, Caroline Dann, Lee Hewett, Harry and Jay (Sound Preservation Society), Chris Harvey, Matt Todd, JunkWax – with residents Lee Grimshaw and Dave Grimshaw, and live vocals from Little Miss Mojo. And more! 20/01/18 – Downliners Sect, The Masonics, Jim Riley’s Blues Foundation – 100 Club, London – Lee Grimshaw DJ support. 26/01/18 – The Spinout Revue at Pop Gallery, Wadebridge, Cornwall – the full team, with guests Matt & Nichola too. 24/02/18 – The Spinout Revue at High Rollers Weekender – Las Vegas, USA – Lee Grimshaw and Little Miss Mojo show. 17/03/18 – Move to the Movement – Forde Hall Social Club, Newton Abbott, Devon – Lee Grimshaw, Little Miss Mojo and Stevie JunkWax. 30/03/18 – Flashkick – The Spinout Revue meets Kill Dogma Hoodoo at The Saracens Plate, Penryn, Cornwall – Lee Grimshaw and Big vern Burns, with special guest Fraze. 22/04/18 – Grinagog Festival – Torquay – Lee Grimshaw spinning some daytime delights. 27/04/18 – Suit Yourself Modernist Rally/Weekender – Bristol (27-29th) – Lee Grimshaw and Dave Grimshaw. 12/05/18 – From The Jam – Princess Pavilions, Falmouth – Lee Grimshaw DJ support. 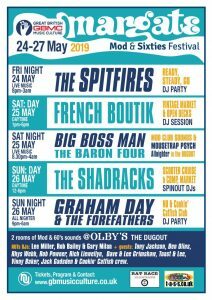 27/05/18 – Margate Mod & Sixties Festival – Margate (25-28th) – Lee Grimshaw and Dave Grimshaw. 07/06/18 – Sidewinder – Islington, London – Lee Grimshaw joins Dave Edwards and Gilo. 08/06/18 – Suit Yourself Modernists Present Big Boss Man – Hope & Ruin, Brighton – Lee Grimshaw and Dave Grimshaw supporting, along with Colin Baldock and Alan Saunders. 09/06/18 – John Simons:A Modernists Private Screening – Hope & Ruin, Brighton – Lee Grimshaw and Dave Grimshaw supporting, along with Colin Baldock and Alan Saunders. 06/07/18 – Dreamsville Mod Weekender 2018 – Claremont Pier, Lowestoft (6-8th) – Lee Grimshaw spinning during the Saturday afternoon. 20/07/18 – Beatwave Weekender, Hastings, East Sussex – (20-22nd) – Lee Grimshaw spinning both Saturday and Sunday. 26/07/18 – Port Eliot Festival! 04/08/18 – Sen-Sa-Shun – Cornwall’s Mod-Infused Alldayer, The Garden, Newquay – Glyn Preece, Ian Hurford, Sonya Fisher, Gini Sykes, Harry and Jay (Sound Preservation Society), Chris Harvey – with residents Lee Grimshaw, Dave Grimshaw and JunkWax, and live vocals from Little Miss Mojo. 21/09/18 – The Spinout Revue Mama J’s Sessions – Looe Saves The Day – DJ Lee Grimshaw and Little Miss Mojo (and guests) – 21-23/09/18. 10/11/18 – Spinout at The Boogaloo Revue – Chatham, Kent – DJ’s Lee Grimshaw and Dave Grimshaw and live vocals from Little Miss Mojo. 17/11/18 – Shiiine On Weekender – Minehead – Lee Grimshaw and Dave Grimshaw DJing the Main Stage on – 16-17/11/18. 08/12/18 – Graham Day & The Gaolers and The Galileo 7, The Lexington, London. DJ Lee Grimshaw spinning Spinout raves to support, for another well earned 30th Anniversary celebration for Damaged Goods Records. 14/12/18 – Jim Riley’s Blues Foundation and The Claim, The Billabong Club, Rochester, Kent. DJ Lee Grimshaw will be spinning Spinout raves in support, and for the ‘after disco’! 16/12/18 – The Fratcave, The Royal Standard, Hastings, East Sussex. With Cee Bee Beaumont and The Cretins live! And DJ Lee Grimshaw will be joining Matt Fuzzrite and NGG Dunk on the wheels of Fratcave steel! 08/02/19 – The Spinout Revue at Barefootin’ – The Night Owl, Birmingham – Spinout’s DJ Lee Grimshaw and live vocalist Little Miss Mojo join resident DJ Glyn Preece (Out of Time). 09/02/19 – Fay Hallam Group – Half Moon Putney, London – with support from King Mojo, and Spinout’s DJ Lee Grimshaw. 21/02/19 – The Spinout Revue presents The Sensation Seekers – The Dead famous, Newquay. The sensation Seekers LIVE, with DJ support from Lee Grimshaw and special guests Tracey Screamcheese and Big Vern Burns. 23/02/19 – The Spinout Revue and The Sound Preservation Society – The Lucky 7 Club, Paignton. Spinout’s Little Miss Mojo and DJ Lee Grimshaw will join The Sound Preservation Society, for a night of moves and grooves. 16/03/19 – Bristol Modernist and Sixties Weekender – Suit Yourself Modernist Rally/Weekender – Bristol (15-16th) – Spinout DJ’s Lee Grimshaw and Dave Grimshaw. We’d love to have your ears, and eyes, for all future Spinout happenin’s.